Check out this amazing 2 pager by kobakyon...so many fun details and a great design! 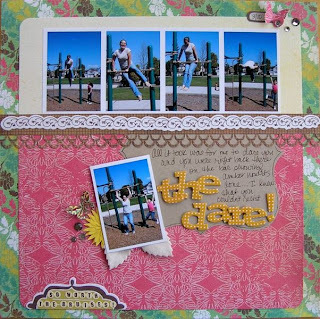 I LOVE the way felicityw used that gorgeous text paper as the background for her layout and how sweet is that photo?! 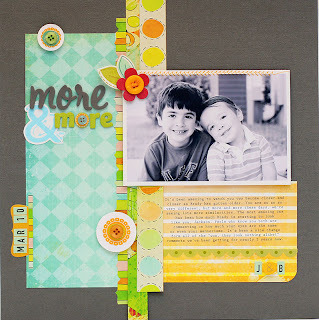 This layout by Laura Fiore is so fun! I love colors and that little photo by the title. And here's my take on the color challenge, which also happens to be loosely based on Kelly Purkey's Sketchbook Sketch #1 :) I decided to spice things up a little (for me ;)) and use a gray background instead of kraft or brown like I usually do. I really like the way it turned out. I also used one of the pink slipped stamps...the ampersand, which won't be available much longer, so grab one now if you've been wavering. 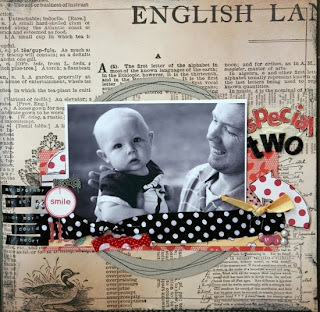 :) I also used Tumbled Glass Distress Ink and some of the orange Studio Calico Button Rubons. I just adore those buttons! I'm hoping to have a date with the gallery tomorrow sometime to see all the fun layouts you all have done for the challenge. Thanks for playing along! I hope you all have a wonderful holiday weekend! These are all great LOs! I love your picks and your own color combo layout! Have a wonderful Easter Kelly!